Step 1. Preheat oven to 180°C (160°C fan-forced). Line a 20cm round cake tin with baking paper and set aside. Step 2. 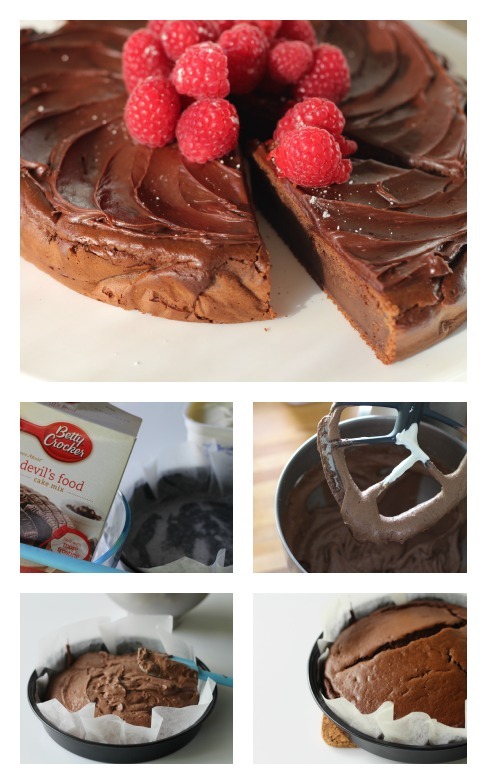 Place cake mix ingredients in a mixing bowl with two cups of the yoghurt and mix on slow speed, adding more yoghurt as you go until you have a smooth, pourable batter. Step 3. Pour mixture into tin and smooth top. Step 4. Bake for 35-40 minutes. Remove from oven and cool in the tin for 10 minutes before turning out onto a cooling rack to cool completely. Pour frosting satchet over the top and spread. Serve with any fresh berries you have on hand. OK, so maybe this cake doesn’t strictly have 2 ingredients once you add the icing but you only have to BUY two ingredients. I added the yoghurt gradually as each different brand has a higher or lower water content and you will get a better product if you add the yoghurt until you have a smooth cake batter. I don’t think this recipe would be successful with natural yoghurt as the water content is too high in this yoghurt.